Most of our grocery shopping is done at the supermarket with the kids, but on weekends, the hubs goes to the market early in the morning to buy fresh meat and seafood. He does the marketing as he's the one who cooks up a storm at home so he knows exactly what to get. He is comfortable with the wet market because he grew up accompanying his dad on their weekly market runs. For me, my mum used to go to the wet market every single day without fail, but us kids had to stand at the side and wait because "the floor is very dirty and slippery". So we never had any firsthand experience in learning to choose the freshest fish nor managed to pick up tips on using which pork/chicken parts for what dishes. Pity. This may sound strange, but I view going to the market as a mini excursion, and take Kate to different markets during the school holidays to while away the morning while the older ones are still asleep. Markets are the most happening places to be at 7.30am! I like visiting markets which have more than just the wet market/food centre and have discovered a lovely market in Bukit Batok where we like to stroll around and soak in the sights and sounds, while picking up one or two small bags of fresh produce. Nothing too serious. This market is not your usual layout, and is basically one long stretch of stalls under the block. The pathway is relatively clean and dry, but with the morning crowd, it does get rather crammed. Let's start our tour at this corner vegetable stall. You can spot it easily on the weekends by the long queue. The price of the vegetables are the lowest around, so the aunties are happy to stand in line to weigh and pay. They would 'chope' their spot in the queue with their basket while they grab a few more items. I have great respect for these aunties who can easily prepare the '3-dishes-1-soup' type of meal daily, while keeping it all within their budget. There are the requisite stalls selling chicken, pork, seafood and beef, but to be honest, I have no clue which stall is 'better'. If I need to buy some meat, I would look for a stall with people waiting, as it is usually a good indication of their popularity! As you walk along, you will see this stall selling just bananas and papayas! Kate loves to stop and buy a small bunch of bananas, and we will sit on a bench and enjoy it together. After she is done, she will run around and chase the birds. I love the atmosphere of this whole area, as it has a charming 'neighbourhood' relaxed vibe about it. As with any market, there is a shop selling dried goods, sauces, and spices. Occasionally I will buy ikan bilis from here to fry as toppings for their porridge. The only stall I patronise more frequently is this yong tau fu stall. I love yong tau fu, and the wide variety means that I can get each of the kids' favourites. Not only that, the auntie doesn't mind me buying just a $1 portion of noodles as only #5 loves to eat the fat yellow noodles (some atas markets have a minimum of $2). And I can't go far wrong with yong tau fu. For the younger kids, I just throw them in some soup with the noodles, while I cook them in laksa broth for the older ones. Quick and yummy! If I need to get some fresh cod or promfret for the kids, I'll buy it from this stall right opposite the yong tau fu stall. We have reached the end of the wet market stalls. Now let's backtrack to the opening where you will notice the egg stall. On this perpendicular street, there are more going-ons. You will hear aunties demonstrating the latest 'cleaning cloth' or some multi-functional kitchen gadget, and surprisingly, there will be a crowd standing around rapt with attention! I get our fruits from this stall which carries a wide variety of fruits. I have learnt that the price of fruits defer quite significantly depending on which market you buy from. So don't forget to compare prices, my dear auntie wannabes! Also on the same stretch is this kueh kueh stall. I love these traditional snacks. Sadly, my kids don't know how to appreciate these and the only thing they would eat is the colourful '9 layer kueh'. As #1 was taking photos of this stall (yes, I dragged her along bright and early to help me with the photos as the stalls are too dim for my phone camera) she spied the colourful baskets with the piggy biscuits and exclaimed, "Mum! We used to eat those during lantern festival." Here's a fun fact I discovered about the cute little biscuits. The story goes that in order not to waste food in the old days, people would use the leftover dough from making mooncakes to make these little piglets without filling. They are literally translated as "Pig cage biscuit" because the plastic cage resembles the traditional bamboo cages used to transport pigs. As we were leaving the market, #1 spotted this uncle sitting on a little stool with the cardboard boxes he has collected and neatly folded to sell. This photo brilliantly captures the spirit of our pioneer generation. Of self-reliance, resilience, and being unashamed to do an honest day's work. I really hope our young people will not slide down the slippery path of thumping their noses to jobs they deem below themselves. I am also glad that the government is taking care of our pioneer generation, who not only gave their all to build our country, but who now face the brunt of the rising cost of living. And I hope that 50 years later, the ubiquitous but diminishing neighbourhood markets will still be around, rich with the sights, sounds, and smells which are so much a part of our home. This post is part of a blog train hosted by Life's Tiny Miracles, to celebrate this unique aspect of our Singaporean way of life - our markets. Next up on To Market, To Market is Pamelia, who is a busy mum of three. She's always planning the next adventure or activity with her three kids! In her free time, she's either playing with flowers or just sitting down to enjoy a cup of coffee. 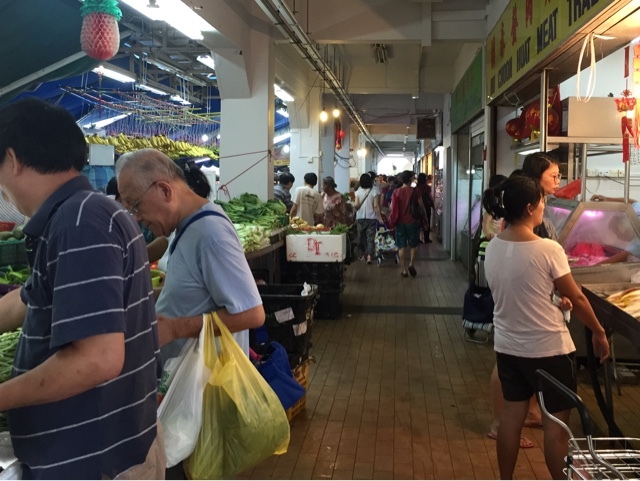 Hop aboard our blog train and read about other local markets in Singapore. Might be too late for myself, but I am trying to coax my boys to pickup cooking. Although I do not have 6 kids, I can understand why you mention "yong tau fu" is your favourite stall haha. WOW the yong tau fu vendor really has an impressive range! And I like the picture of the uncle with his cardboard. Yeah, I love it too. And when #1 showed the pic to me, so many thoughts came to mind.. quite sad though. And I realise she seems to be drawn to taking photos of the elderly.